Puch 70cc - 74cc exhaust gasket for kitted cylinders. 27mm ID super nice quality version with a metal lined ring around the center. Stock 50cc head gasket for A3 and A35 Tomos engines. 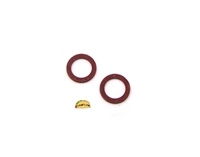 Complete gasket set for the 70cc 45mm Puch Athena AJH reed cylinder kit. Puch clutch cover gasket for the one speed, pedal start e-50 engine. Complete gasket set for the 65cc 43.5mm Puch Metrakit. Stock metal head gasket for all model motobecane engines. All aluminum head gasket for stock morini motors - m1, m01, m02, m101. Original Puch brand za50 two speed engine clutch cover gasket. Airsal brand 70cc - 74cc metal lined graphite head gasket. This works for the 45mm 70cc cylinders and the 47mm 74cc cylinders. Complete top end gasket set for the Puch Airsal 38mm 50cc cylinder kits. Complete top end gasket set for the Puch Airsal 45mm 70cc cylinder kits. Complete top end gasket set for the Tomos 44mm 70cc Airsal cylinder kits. Complete top end gasket set for the Tomos 38mm 50cc Airsal cylinder kits. Transmission fluid oil fill level bolt for puch e50 engines. This is the one that threads into the side of the e-50 clutch cover. Transmission fluid drain bolt for puch e50 engines. Get the gasket too if you need it. Stock tomos metal lined exhaust gasket for a3, a35 and a55. Super nice quality 32.6mm x 24mm x 4.4mm exhaust crush gasket. Complete gasket set for the 65cc 43.5mm Puch Polini kit. 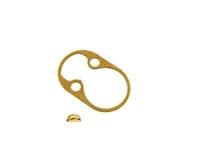 Replacement flot bowl gasket for round bing carbs 12mm-15mm. 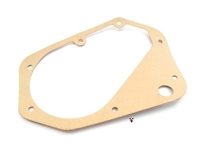 Puch 50cc exhaust gasket for stock cylinders. Super nice quality version with a metal lined ring around the center. two gaskets, one for either side of the fuel inlet or banjo on your bing carburetor. they measure 12mm OD and 8mm ID and will work with bing carburetors 12mm through 15mm varieties with the banjo style fuel inlet. Bing carb gasket rebuild set. Includes one float bowl gasket, one top gasket, and two banjo gaskets. Replacement gasket set for the 47mm 74cc Puch Gilardoni cylinder kits. Super high temp silicone RTV gasket maker from Permatex in a 3oz tube. Perfect for sealing up e50 cases, clutch covers and mating surfaces that just refuse to seal. Temperature range -65ºF to 650ºF. Resists gasoline, oil and auto/shop fluids. Permatex fuel tank repair kit. Fills in pin holes and cracks in your gas tank! Transmission fluid drain bolt gasket for puch e50 engines. Get the bolt too if you need it. Exhaust gasket for stock maxi exhaust pipes. This is only for the two part maxi pipes. It gets squished between where the header and baffle meet. Nice thick gasket for Sachs clutch covers. Set includes clutch gasket, base gasket, 50cc aluminum head gasket, metal lined exhaust gasket, square port intake gasket and the round gasket for the exhaust header. 45mm ID aluminum head gasket for 70cc motobecane kits. Replacement gasket for a dellorto SHA float bowl. Stock 50cc aluminum head gasket for Vespa. 70cc 43.4mm aluminum head gasket for Vespa. 70cc head gasket for peugeot motors. 50cc head gasket for peugeot motors. House brand base gasket for minarelli v1 engines. House brand engine case gasket for minarelli v1 engines. House brand intake gasket for minarelli v1 engines. Original exhaust gasket for derbi cylinders. Original intake gasket for Derbi piston port cylinders. Original oil drain bolt gasket for derbi. Original oil drain bolt plug for derbi. Original plastic oil fill bolt plug for derbi. Top end set of gaskets for a motobecane av7 engine - head, base, intake and exhaust. Top end set of gaskets for a Minarelli v1 engine - head, base, intake and exhaust. Stock 50cc aluminum water jetted head gasket for minarelli v1 engines and carabela too!